LA GUAJIRA, COLOMBIA–In the Guajira, a remote northern region of Colombia, the human and environmental costs of coal extraction go beyond the climate crisis, and it is Atlantic Canadians who are fueling part of the demand for Colombia's mineral fuel. 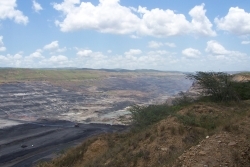 Production at the Cerrejón coal mine started in 1976, and through the course of its operations it has come into conflict with Afro-Colombian and indigenous Wayuu communities, whose existence and cultures have long depended on the surrounding lands and rivers. Their livelihoods are under constant threat because of the expansion of the mine, the largest of its kind in the world. As the biggest exporter of Colombian Coal, Cerrejón counts Canadian utility companies Nova Scotia Power and New Brunswick Power amongst its clients. The beginning of major imports of Colombian coal coincided with the closing of the last nationalized mines in Nova Scotia in 2001. The climate of fiscal austerity at the time compelled the Liberal-led federal government to view the mining operations as too expensive. Buying coal from overseas sources, such as the Cerrejón operation, was seen as a the more cost-effective strategy. Colombia’s armed conflict has defined the country’s economic and social layout for over 40 years, resulting in arguably the worst humanitarian environment in South America. There are at least four million internally displaced persons within Colombia’s borders. The country also carries the dubious distinction of being the world's most dangerous country for unionized labour. Since 1991, over 2,300 unionists have been murdered with few charges laid in any of those murders. As major economic players in a country whose elites are focused on attracting foreign investment, BHP Billiton, Anglo American and Xstrata operate the Cerrejón consortium, and enjoy a comfortable position of advantage over the local communities. The companies orchestrated the destruction of the small Afro-Colombian town of Tabaco, without any attempt to facilitate a collective relocation for the dispossessed residents. Leading up to Tabaco’s displacement, Cerrejon pursued a strategy of buying out individual property owners rather than negotiating with the community as a collective through their elected Committee to Relocate Tabaco. At the time of displacement in August 2001, 67 families out of 120 represented by the committee still had not received compensation. According to the company, the community consultations and expropriations were carried out within the framework of the law and consent of the area's municipal seats. An independent panel assessing the Cerrejón's consultation process earlier this year recommended that "It might be appropriate, furthermore, to continue to promote group as opposed to individual re-settlement, as is advocated in modern standards covering re-settlement." The panel advised the companies to acquire land for the approximately 20 remaining families and that its development should be assisted by the companies. The independent review recommendations show promise for improved practices in community relations, but for the remaining communities in the area, the fear of meeting a similar fate as Tabaco remains part of the hardship of dealing with the encroaching open-pit coal mine. The suffocating dust from the operations, the pollution of the river that was once the life-blood of the villages, the lowering of the water table, the degradation of farmland and the harassment from mine-employed security forces serve as daily reminders that politicians and business leaders place profit before the well-being of people and the land. 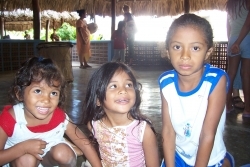 As far as politicians and economic development technocrats are concerned, the ‘progress’ brought to the Guajira by the mine is measurable through indicators such as increased GDP and foreign investment, the creation of mining jobs, and public relations-boosting social spending by the Cerrejón Foundation, the charity arm of the company. In reality, many of the best jobs have gone to outsiders and the investment in healthcare and education programming by the Cerrejón Foundation has occurred only in the Guajira’s main municipal areas of Riohacha and Barrancas, out of reach of the remote communities in the rural zones near the mine. Villagers from the Wayuu community of Tamaquitos, along with the Afro-Colombian communities of Chancleta, Roche, Patilla and the already destroyed Tabaco, worked hard to make their voices heard as they resist the advances of the mine. "We’ve gone from being a productive community to a community of paupers,” said president of the Chancleta neighborhood council, Wilman Palmezano, "In the 1980s, the company started buying up land and today we have nowhere left to sow crops, nowhere to put our animals." Years of work to raise the profile of their struggle has started yielding results, and the community members can now count the mine’s unionized workforce among their allies. Despite already facing enormous struggles of their own, the workers of Sintracarbón, the national union of coal industry workers, insisted that the plight of the communities affected by the Cerrejón’s operations are indeed a concern for the workers, and the union succeeded in convincing the company to be at the table for future negotiations with communities concerning their land. “There’s been talk of coal for the world and progress for Colombia. If that is so, we ask, to what country do our towns of Chancleta, Roche and Tabaco belong?" asked Eder Arregoces, president of Chancleta’s community action council. "[Cerrejón] may be one of the largest coal mines in Latin America but most families here can eat only one meal a day," he said. Solidarity from Atlantic Canada, via the Mining the Connections campaign, has sought to raise awareness among consumers of the coal and bring international attention to the strugging communities. Suzanne MacNeil is a political science student and associate editor of Colombia Journal.